First, the R-Phase heat treatment technology optimizes the molecular phase and properties of NiTi during the manufacturing process, modifying the crystalline structure to increase flexibility and breakage resistance. Second, rather than grinding the flutes, which is done in the manufacture of other files, this file’s twisted design optimizes the grain structure and eliminates the formation of microfractures. Finally, the Twisted Files’ surface conditioning finishes the file while maintaining the integrity of its underlying structure. The Twisted File is strong enough to shape ideal paths confidently, but fast enough to do it quickly and accurately. In addition, the file improves safety by resisting separation. Sharpness, strength, and flexibility allow clinicians to work in difficult situations with efficiency and confidence, creating a better treatment experience for the dentist and patient. The Twisted File comes in packs of 3 because they last longer and work more efficiently. 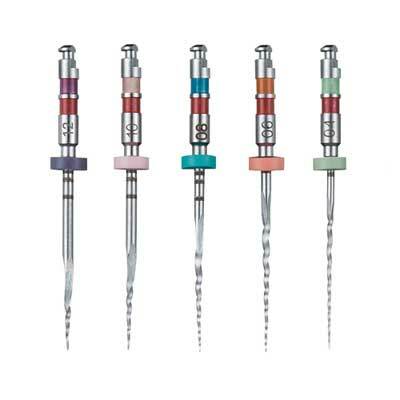 The Twisted file lowers the number of files used per endodontic case, improves clinical efficiency in completing endodontic cases, reduces chair time for patients, and lowers the level and cost of file inventory.